The Challenge, the controversy: whose story do we tell? There, we see a lifelong activist who had been challenging white supremacy for decades before she became the famous catalyst for the Montgomery bus boycott. We see a woman who, from her youth, didn’t hesitate to indict the system of oppression around her. As she once wrote, “I talked and talked of everything I know about the white man’s inhuman treatment"
he artifacts displayed at a media preview last week included Parks’s tiny Bible; a snapshot of the Tuskegee, Ala., house where she was born in 1913; and letters to her mother, Leona, and her husband. Parks sought to set the record straight: “People always say that I didn’t give up my seat because I was tired, but that isn’t true. I was not tired physically, or no more tired than I was at the end of a working day…. No, the only tired I was, was tired of giving in.” She later said she couldn’t have lived with herself if she had given in and stood up. The collection, which contains approximately 7,500 items in the Manuscript Division, as well as 2,500 photographs in the Prints and Photographs Division, documents many aspects of Parks's private life and public activism on behalf of civil rights for African Americans. The collection is on loan to the Library for ten years through the generosity of the Howard G. Buffett Foundation. 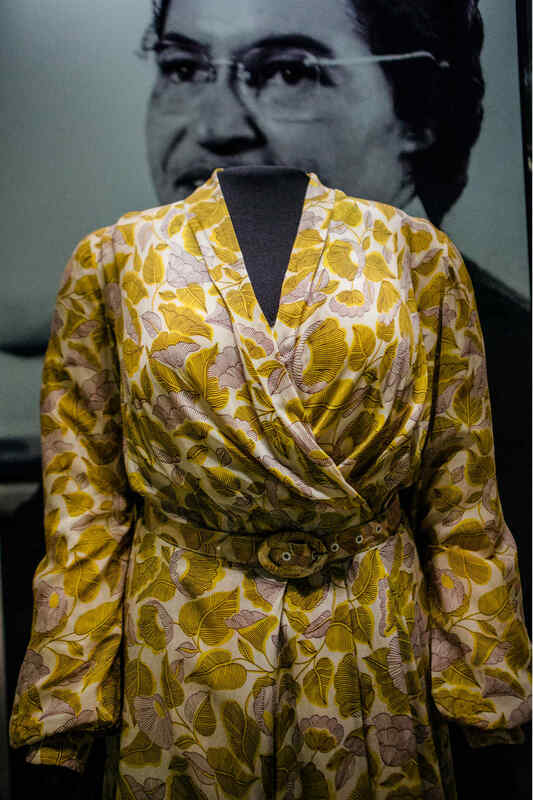 This gallery showcases a selection of items from the Rosa Parks Papers at the Library of Congress, a gift from the Howard G. Buffett Foundation. This collection contains thousands of items that document the life, work, and legacy of this civil-rights legend. his was the place, Rhea McCauley says, where her aunt Rosa Parks fled after death threats chased her out of Alabama, taking refuge at her brother’s home in Detroit to continue her civil rights activism. This was the place, this tiny house, where McCauley’s 12 brothers and sisters joined “Auntie Rosa” at the dinner table to say grace before Sunday dinner, eating corn and tomatoes and strawberries that McCauley’s father grew in their garden. Steven Cohen, attorney at the Rosa and Raymond Parks Institute for Self Development, is less sure of the house’s authenticity. A dispute related to a house where some say Rosa Parks lived — and where some others say the iconic civil rights activist did not live — led Brown University to announce on Thursday that it would cancel a much anticipated exhibit of the home. The surprise announcement reverses the announced in February “that final preparation" was underway to bring a house belonging to the family of civil rights pioneer and American icon Rosa Parks to the University from Berlin as part of an exhibition on Parks and the Civil Rights Movement. Reconstructed in the WaterFire Arts Center’s cavernous main hall on Saturday, the exterior walls and windows of a simple two-story Detroit house stood behind a rope barrier. In an adjacent room, a group of artists and academics were using the old building as an opportunity to think about how we remember famous people — in this case, civil rights icon Rosa Parks. The house now sits half-rebuilt in an old factory in Providence, where it is at the centre of a bitter dispute between members of Parks's family, an American artist, and an institute Parks co-founded. The African American experience is the lens through which we understand what it is to be an American. The African-American story is an American story, as central to the country’s narrative as any other, and understanding black history and culture is essential to understanding American history and culture. How Do You Tell the Story of Black America in One Museum? Like the Vietnam Memorial, the 9/11 Memorial Museum and other institutions built to record painful history, this museum has a challenging mandate — to commemorate, celebrate, provoke and heal. The 9/11 Memorial Museum serves as the country's principal institution concerned with exploring the implications of the events of 9/11, documenting the impact of those events and exploring 9/11's continuing significance. The National Museum of the American Indian (NMAI) Museum Research and Scholarship Group aims to advance understanding of Native knowledge, history, culture, art, and self-determination in collaboration with Native communities and scholars through research, scholarship, and repatriation. Remember the Children: Daniel’s Story is the Museum’s primary exhibition program for young people and their families. The exhibition tells the story of one family’s experiences during the Holocaust from the perspective of a boy growing up in Nazi Germany. Demographics, education, transportation, economy, health, housing, infrastructure, food. ublic art is not an art “form.” Its size can be huge or small. It can tower fifty feet high or call attention to the paving beneath your feet. Its shape can be abstract or realistic (or both), and it may be cast, carved, built, assembled, or painted. It can be site-specific or stand in contrast to its surroundings. What distinguishes public art is the unique association of how it is made, where it is, and what it means. OUR GOAL IS TO TRANSFORM RHODE ISLAND INTO A VIBRANT, VISUAL NETWORK THAT CAPITALIZES ON THE STRENGTHS, TALENTS, AND DIVERSITY OF ITS PEOPLE. History Reference Center offers full text from more than 1,620 reference books, encyclopedias and non-fiction books, cover to cover full text for more than 150 leading history periodicals, nearly 57,000 historical documents, more than 78,000 biographies of historical figures, more than 113,000 historical photos and maps, and more than 80 hours of historical video. Main site for all electronic databases provided by EBSCO.